The dual elites are a great terrorist only weapon. 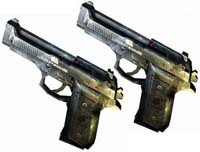 The advantage they have over other pistols is their rapid rate of fire combined with their large clip size. You'll see many kamikaze maniacs make their last stand with these babies. However their drawback is that they do less damage than other pistols and take nearly 4 seconds to reload! This makes them one of the slowest reloading weapons in the game. The dualies are very useful however are frowned upon by many serious gamers as they are a very 'spam friendly' weapon and many noobs use them.